the adventures unknown | miniatures and modeling! about a month ago i was invited on facebook by Vidpui Markes to participate in a challenge! the so called Wargamer £5 challenge. buy a model for £5 or less ( or equivalent in other currency) not including postage. 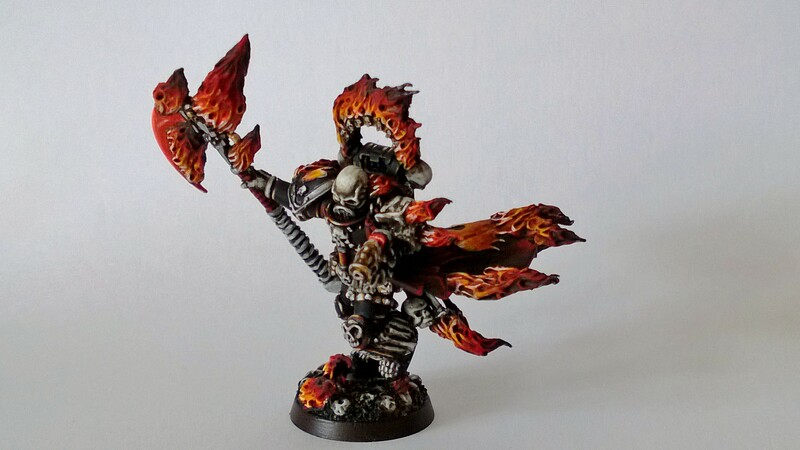 Paint the model to your best ability and sell it on ebay through action. the one that sells his/her model for the most amount has the right to brag! a few days later i got my model in the mail. 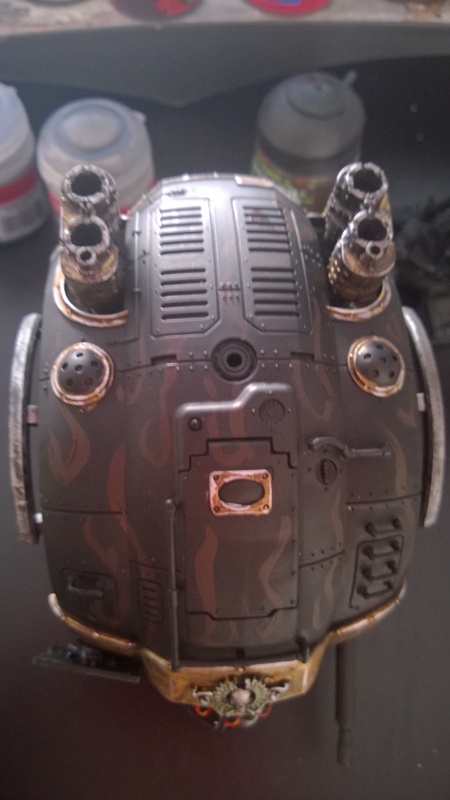 really excited but busy with other painting stuff (an imperial Knight) i postponed it for 2 weeks. 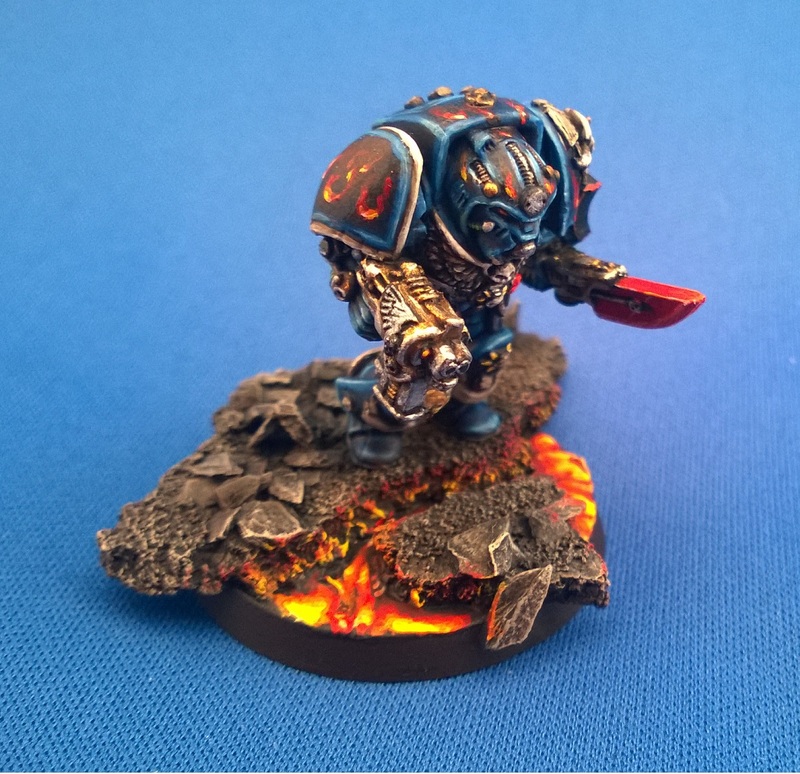 as the librarian needed a new base ( because he’s a terminator) i gave him a larger lava base. painting only took a couple of hours, but i am really proud of it! so here is the end result! after finishing i made an auction on ebay! now to see if it sells for more then the starting price! 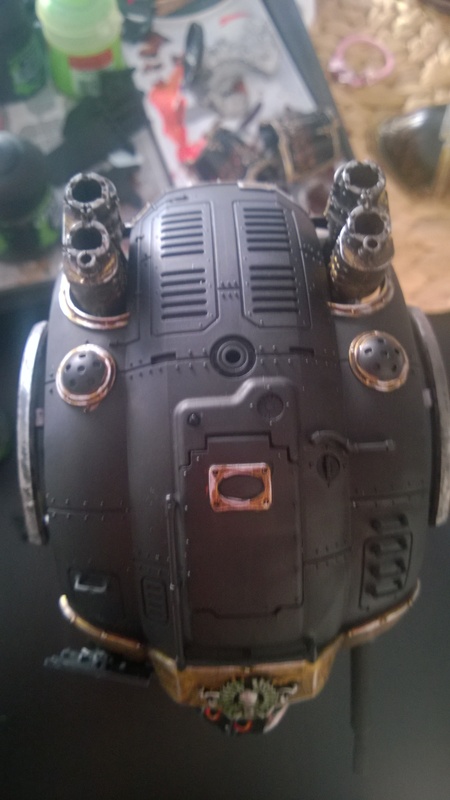 I made some pictures on how i did them on the top armourplate of the knight titan which i’m painting at the moment. 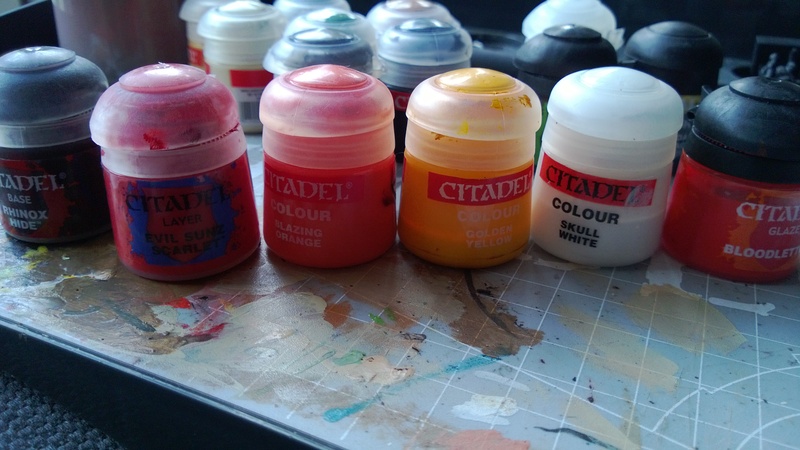 i used rhinox hide, bloodred, fiery orange, sunburst yellow and skull white (not really sure about the names, but this what they used to be called! 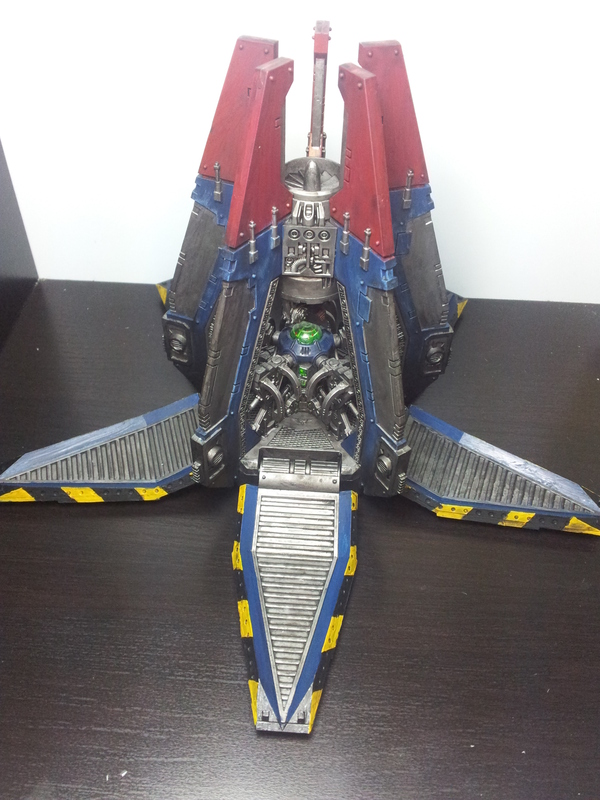 After this i used a red glaze and gloss varnish. 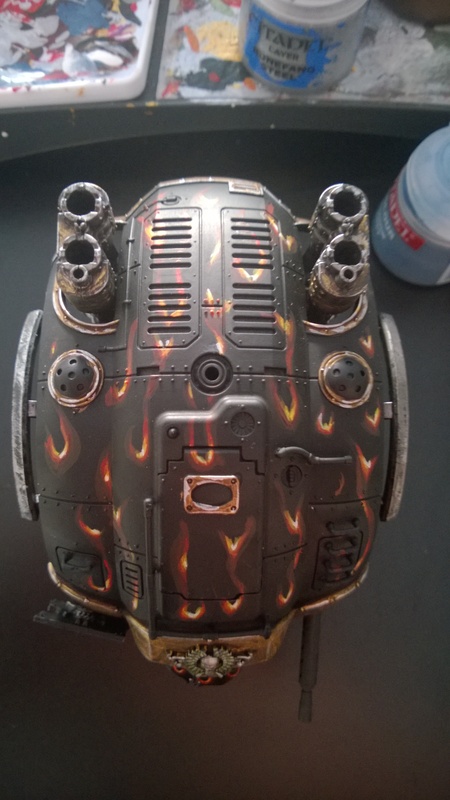 For all this i used a large eavy metal brush! 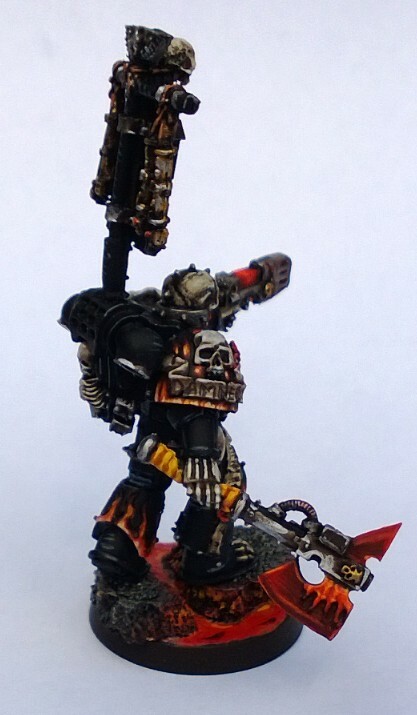 My Legion of the Damned commander is finally finished. 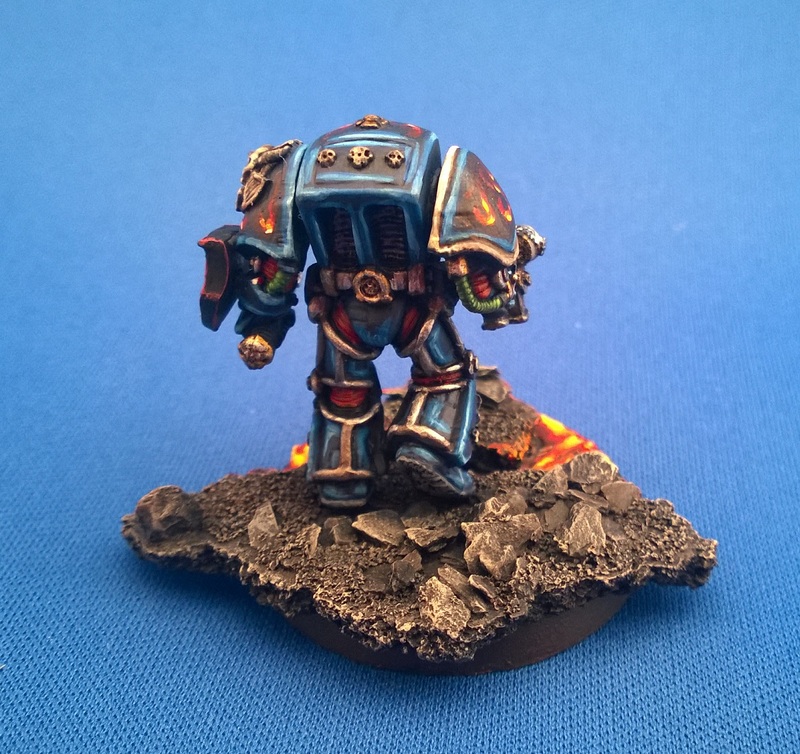 it was really difficult to make the paintjob on my commander worth the sculpt that was made by @wh30k , but i guess it came out real nice! 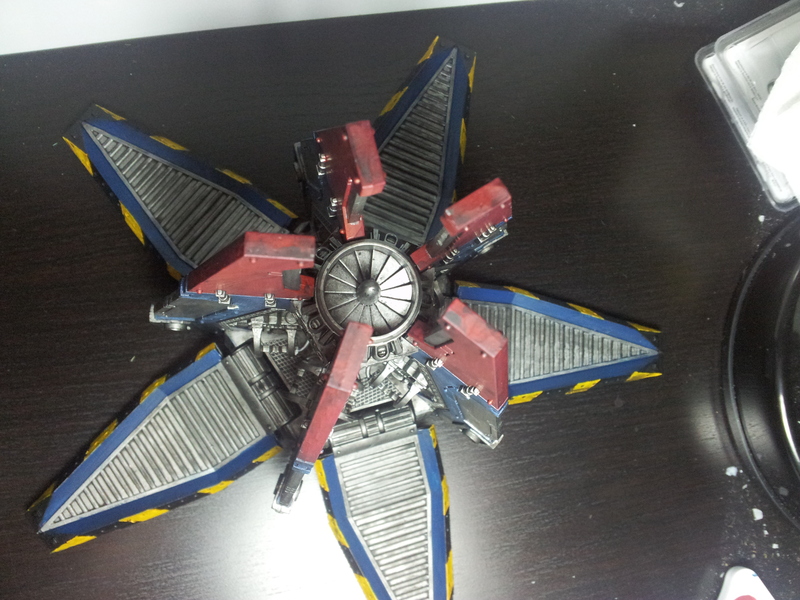 i tried to use as few colours as possible on the model, otherwise certain parts would stand out to much from the rest. 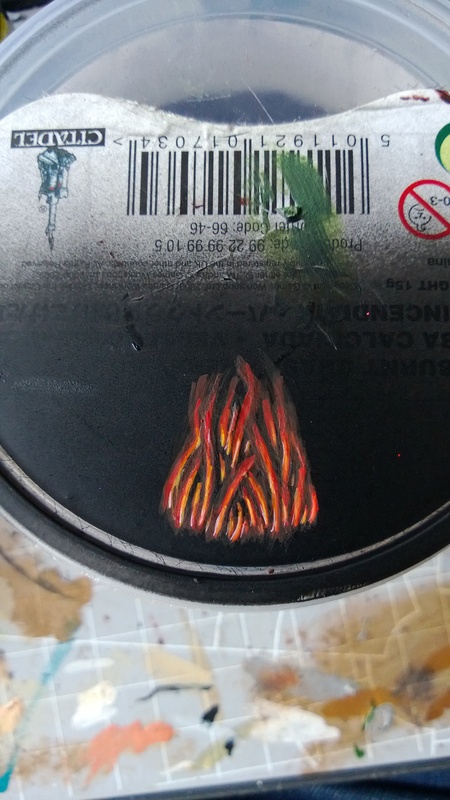 i tried to keep the focus on the flames as much as possible. i have posted him allready on twitter, but i’ll show him here anyway. 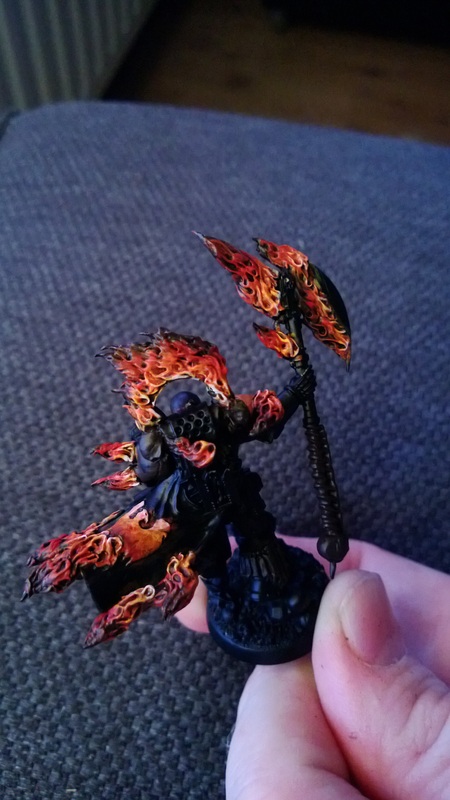 a few days ago i was busy painting some of my legion of the models and was asked to do a tutorial about on how i did the flames. I tried to take as many pictures of my next LotD model i still forgot to take one each step. It’s still a work in progress, but here is a picture of it! 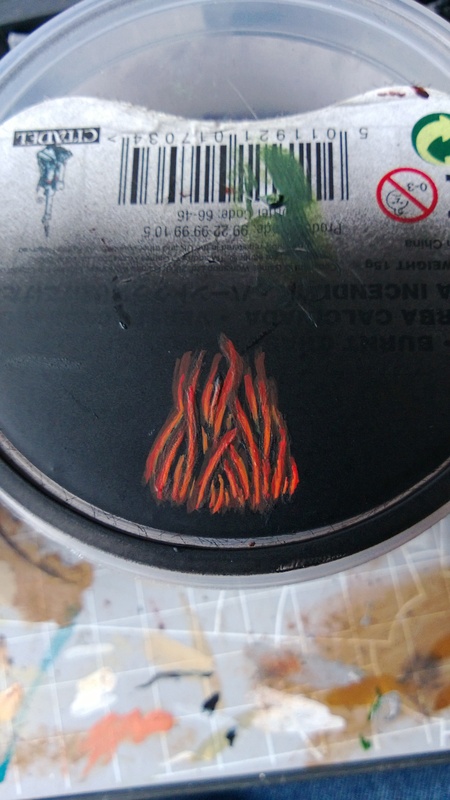 got an enormous responce on #miniaturemoday picture and yet again was asked to do a tutorial on the flames. black ( just basic undercoat), rhinox hide, evil sunz scarlet, blazing orange, golden yellow, skull white and bloodletter glaze. 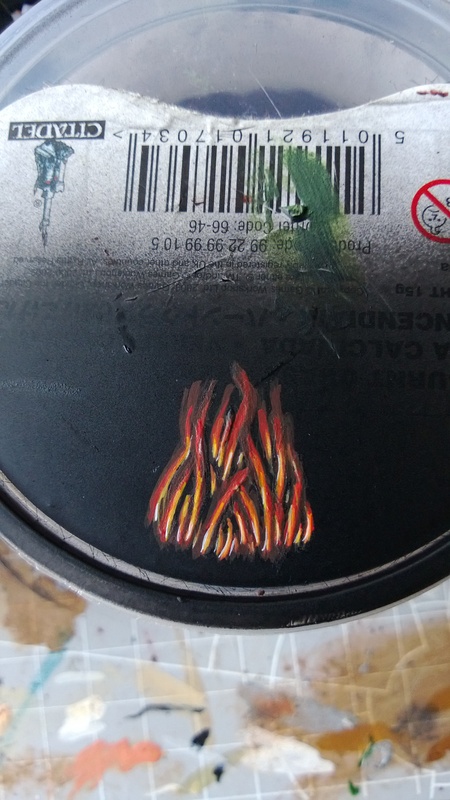 before undercoating i painted some flames with liquid greenstuff on the lid. 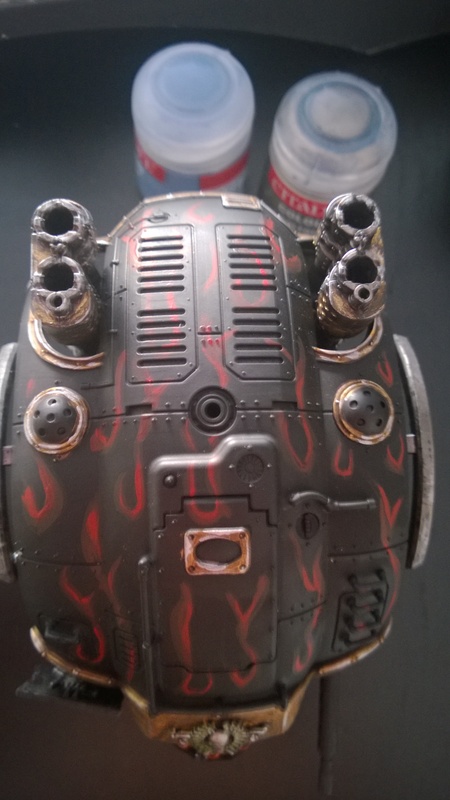 as the first step i painted the flames with rhinox hide . 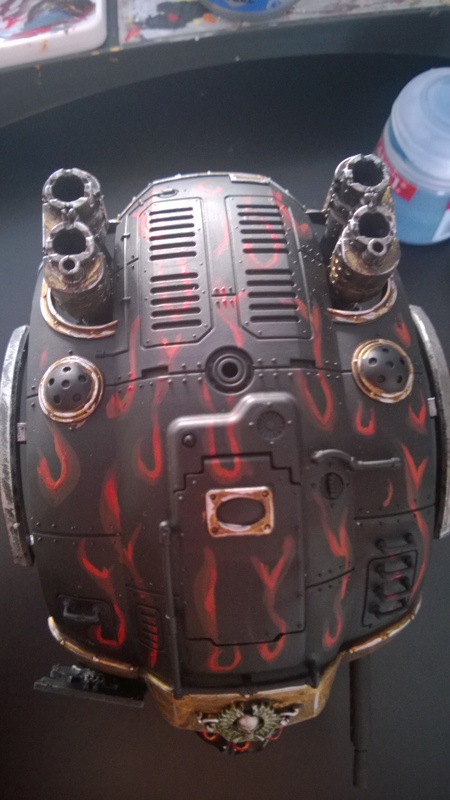 i then added some red (50/50) to the rhinox hide and painted the flames, but just leaving the tip of the flames brown. 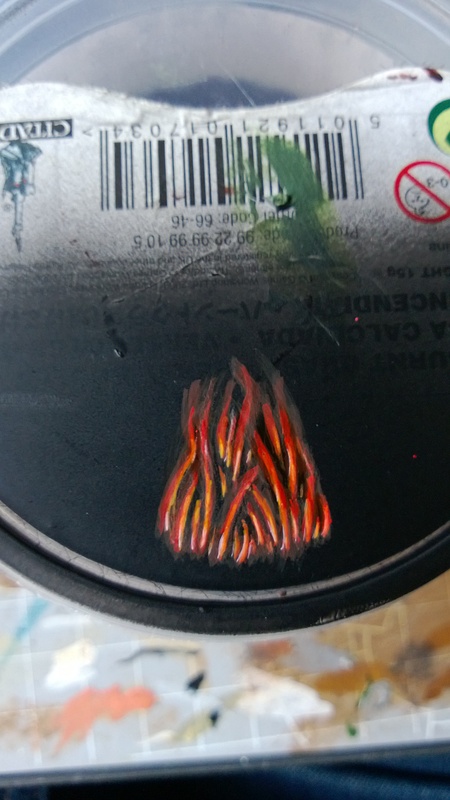 Next i painted with only the red, stopping a bit further away from the end of the flames. 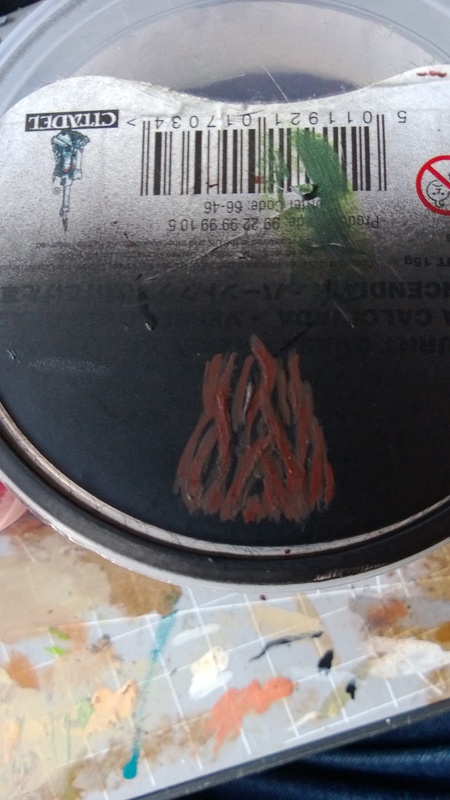 as pure orange was to bright to paint next, i first mixed it 50/50 with the red and did the pure orange after that. 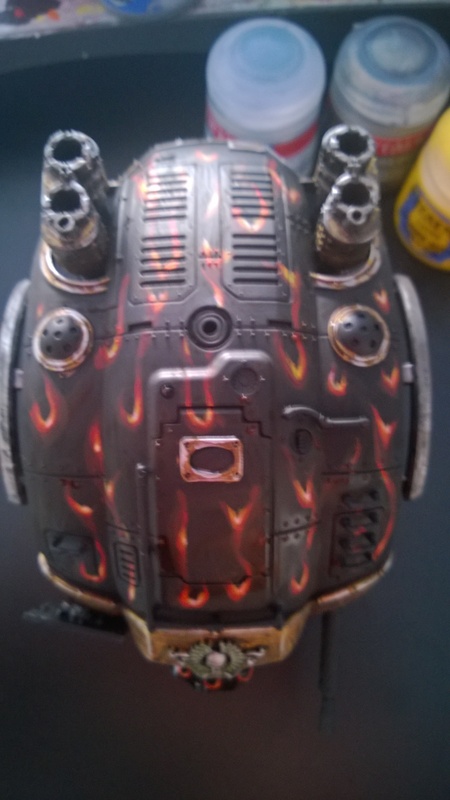 as yellow is done i now needed to ad some white as the hottest parts of the flames. 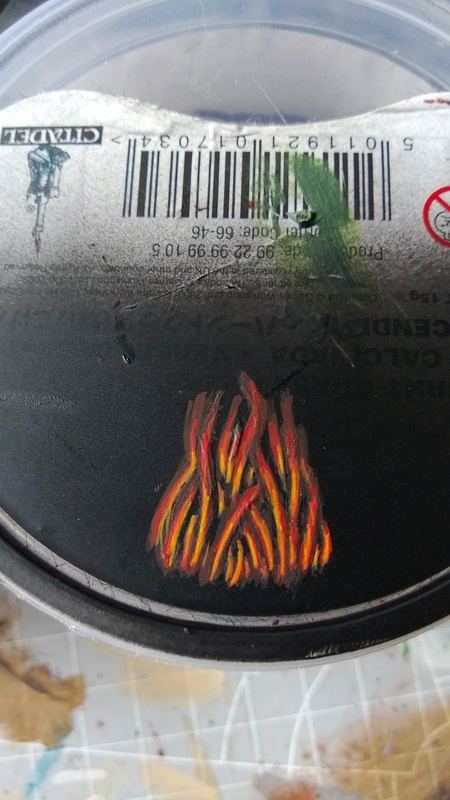 first i mixed it 30/70 with yellow and some pure white highlights after that. 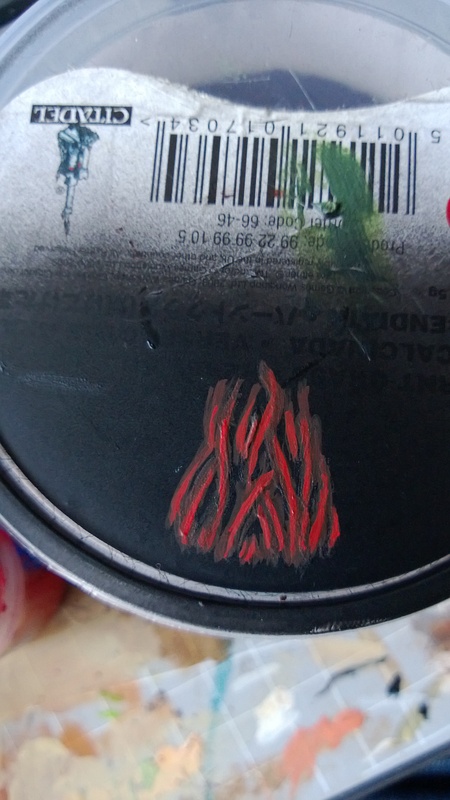 for blending the colours, i used the red glaze. and to finish it of i put some ‘ardcoat on it! 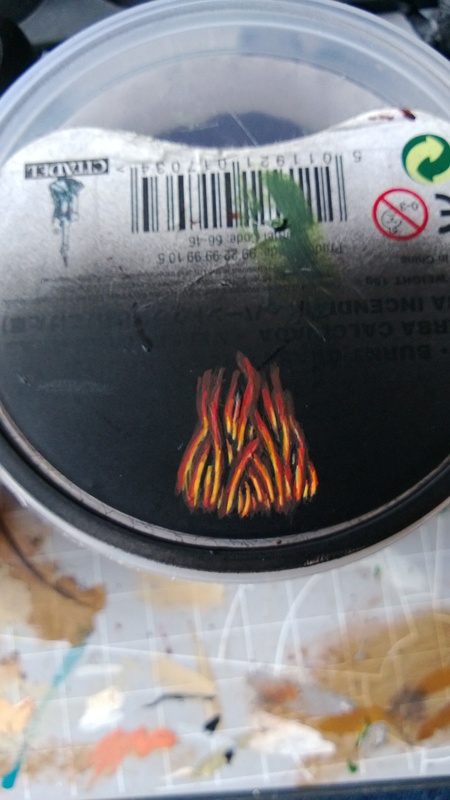 this is the way i paint my flames on any 2Dor 3D surface. hope you guys gonna use it as well. i would love any comments! 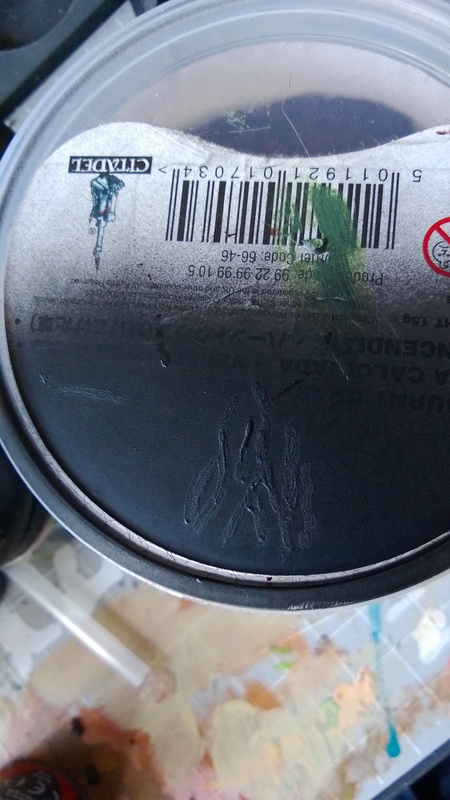 A while back i was struck with the legion of the damned virus. I allready decided to make most the marines myself. 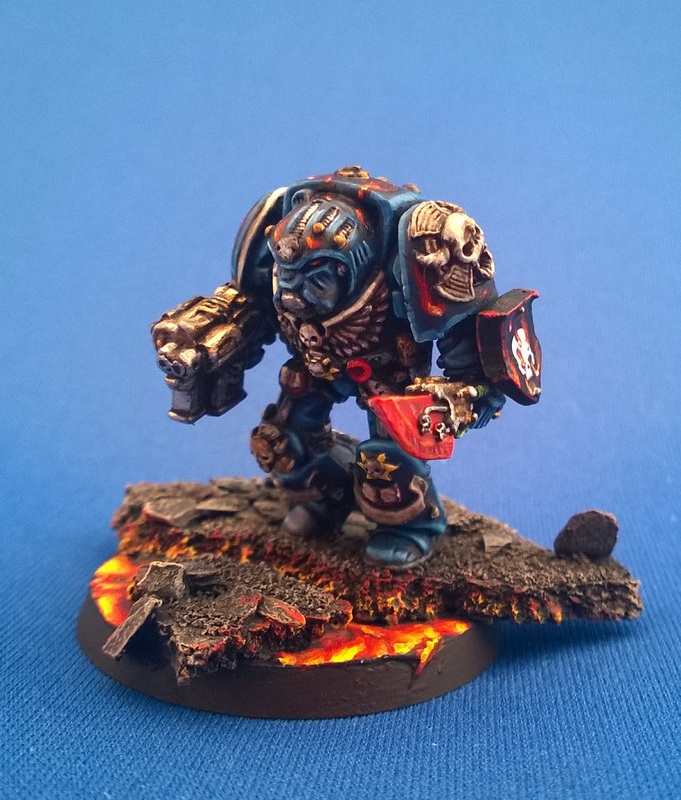 However i wanted to buy the standard box with that legion sergeant in it, because its a soooooo cool model to paint! 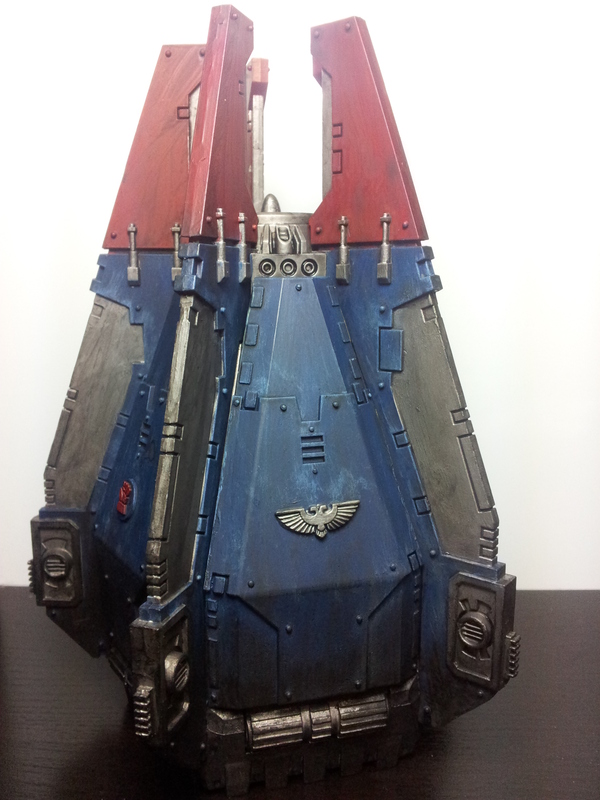 Most of you probably saw it allready on #miniaturemonday but for the rest of you…..
see the result of that painting below! 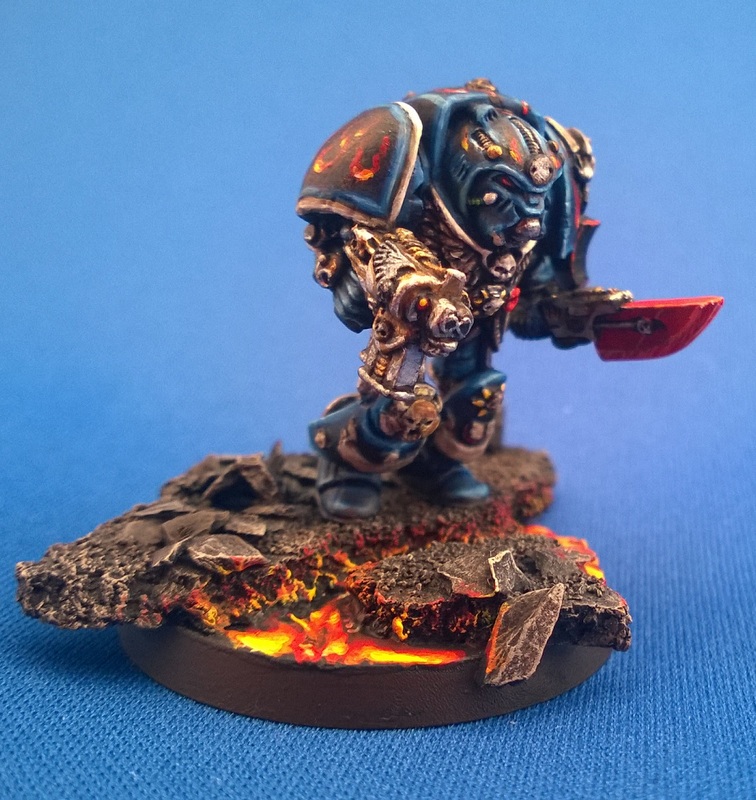 i really think that the lava bases fit the lotd marines very well. 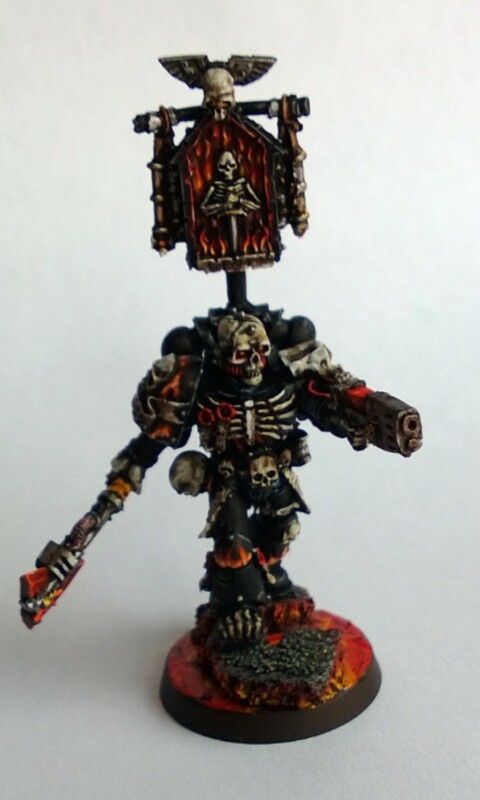 brings a nice contrast with dark and sinister look of the marines. 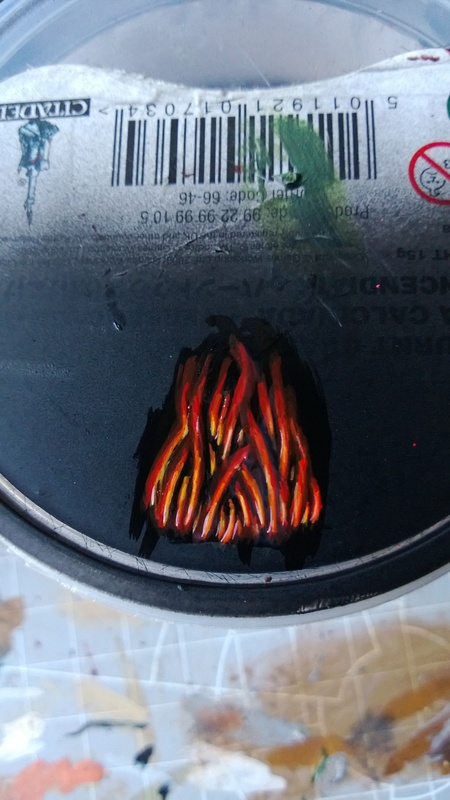 I started with a white undercoat for the lava. 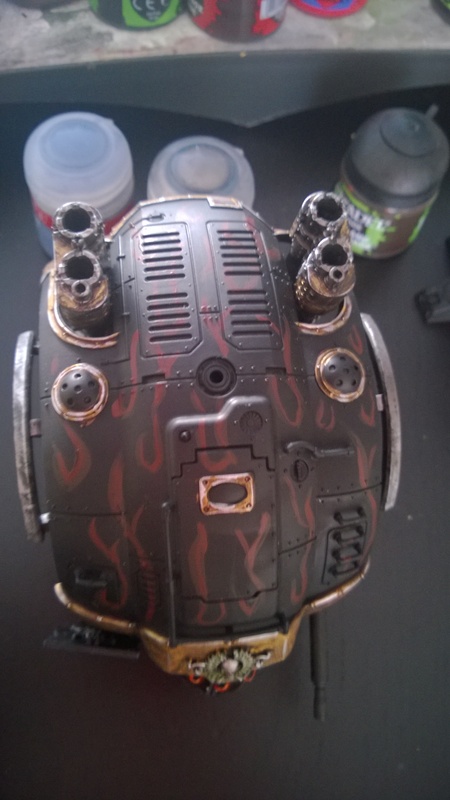 golden yellow was painted over that, followed by a wash with agrax earthshade. Then i painted another layer of golden yellow from the raised areas to the sides. 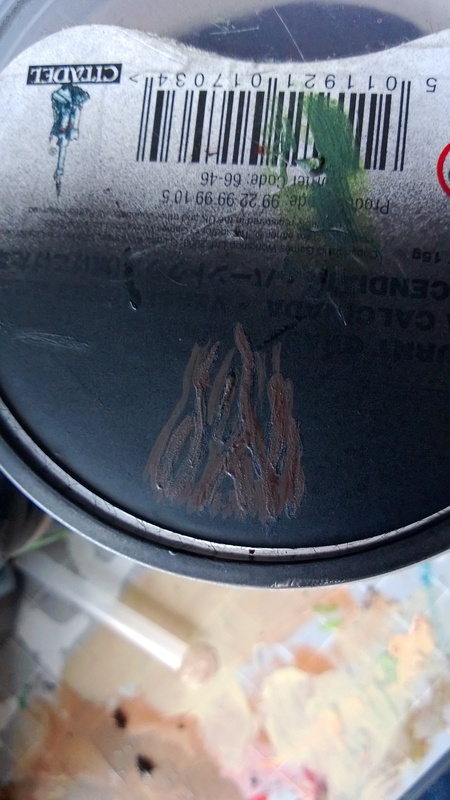 when this was dry i used a bright orange leaving a small line of yellow at the raised areas. blood red was then applied on the biggest part of the lava leaving some orange. 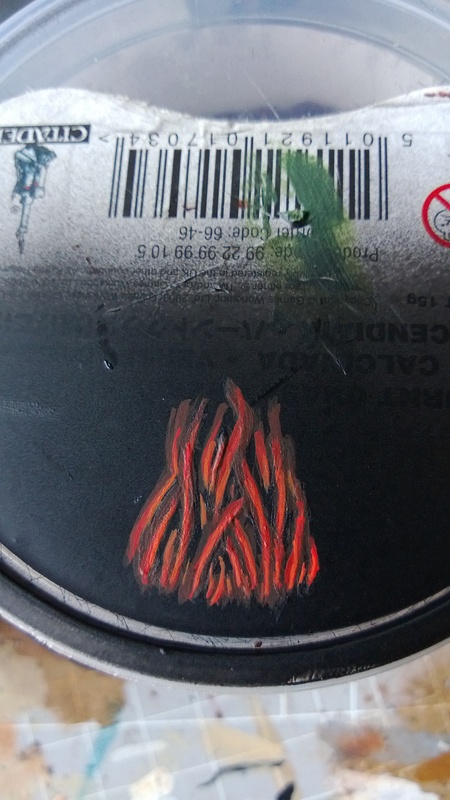 I then glazed the base with red which blended the colours really nice. I re did some of the yellow to make it bit more bright at some spots. 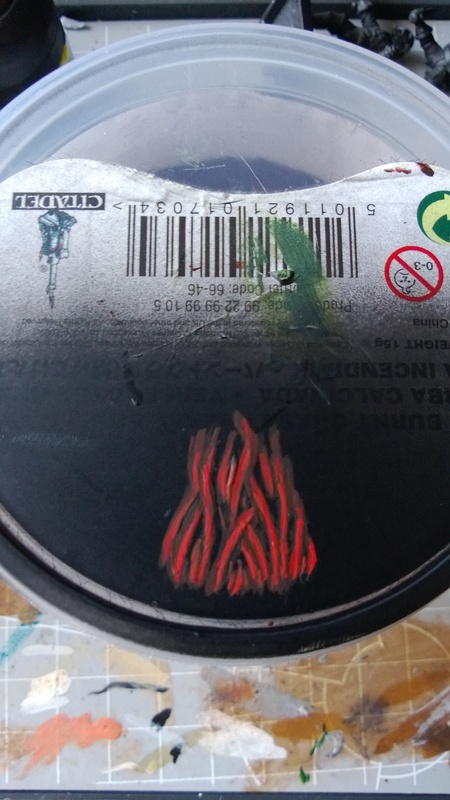 Black was then put on some spots to make it look like the lava was cooling down at some places. 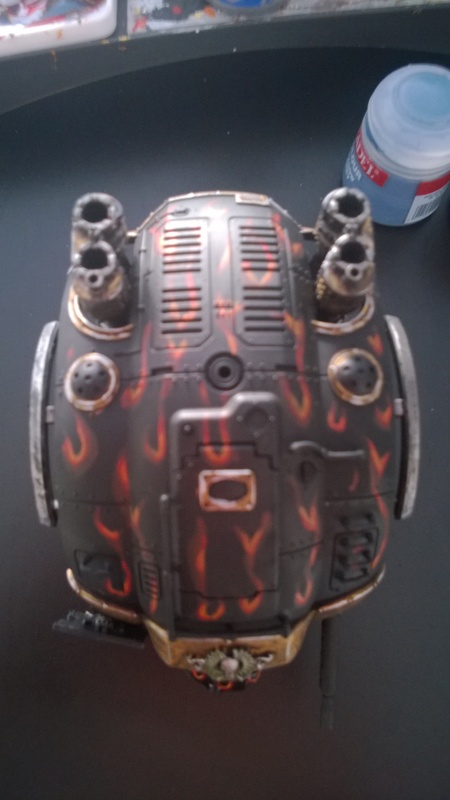 For the OSL i drybrushed the sides of the rock first with red, then with orange and on some places with a little yellow! 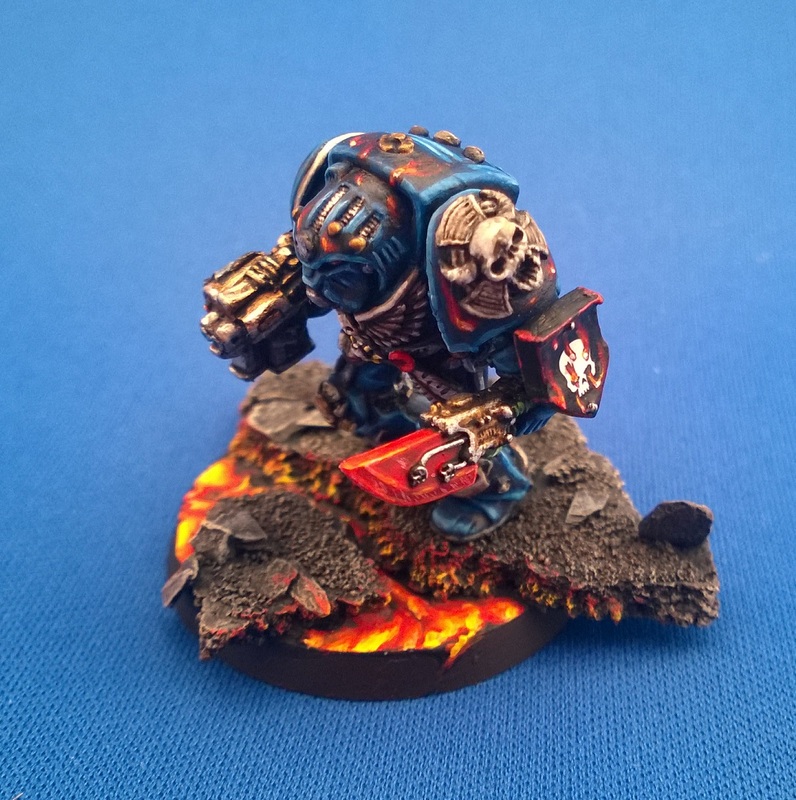 There is a sergeant Centurius coming my way soon, thats gonna be awesome painting session. He will be epic!!! 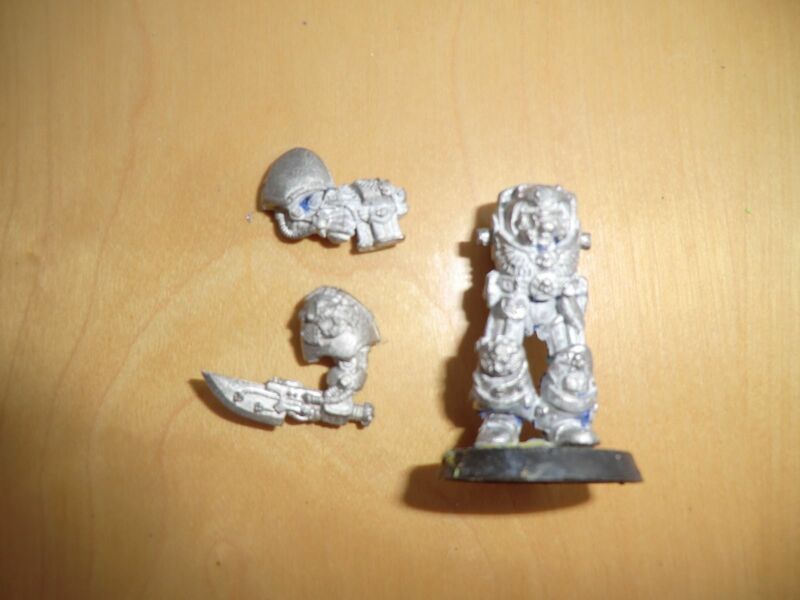 The lotd character created by Steve @WH30K which is gonna take me further then before with painting. I will keep you updated when i get it! 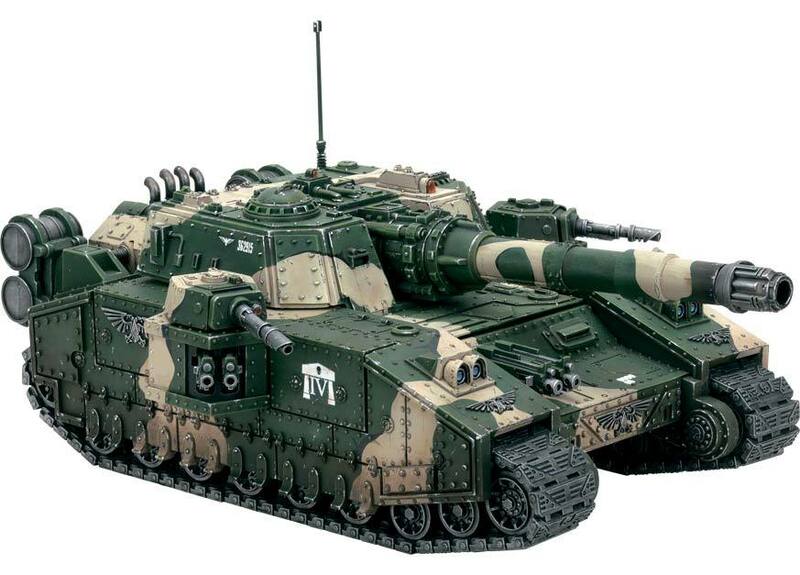 As i have started a legion of the damned army, i definatly need vehicles to back up my troopers! 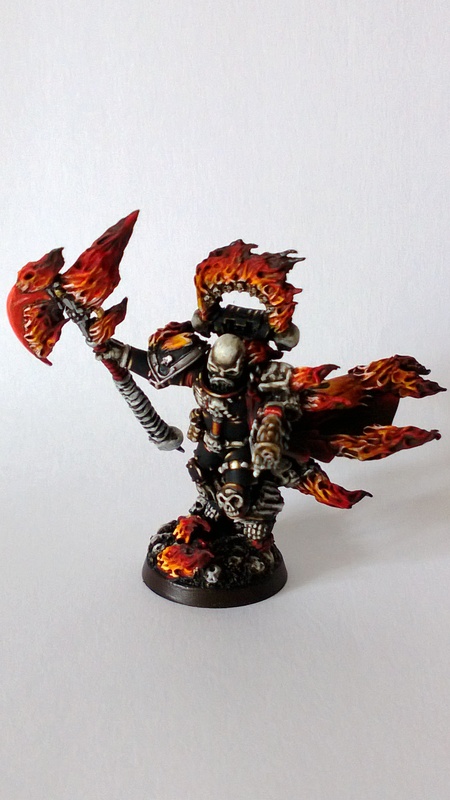 For my LotD i needed to put some flames on him. 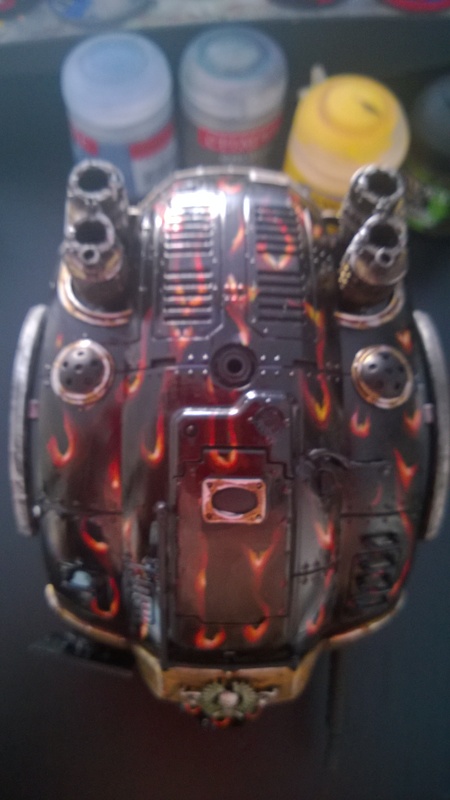 I tried first with liquid greenstuff to layout the flames before painting. 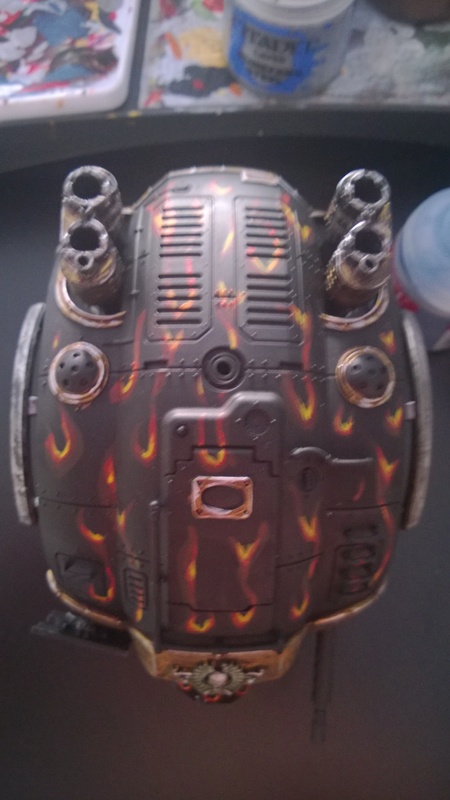 I decided to put the bones later on with some freehanding. 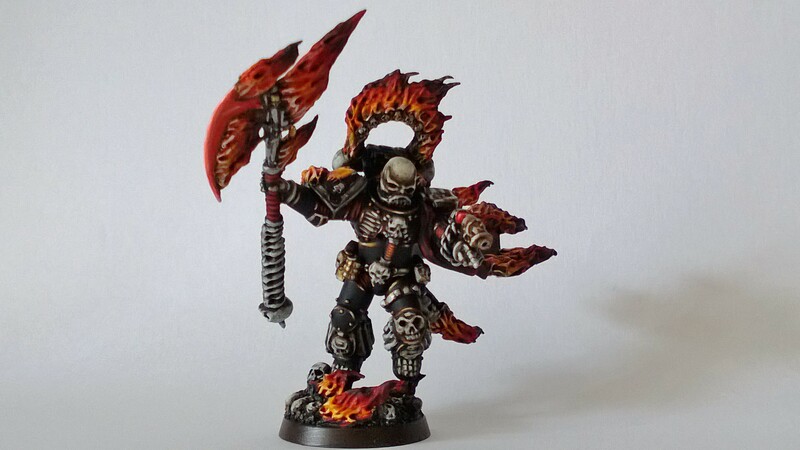 The flames on my legion of the damned marine were really bright. This can’t work imho on vehicles they needed to be darker. 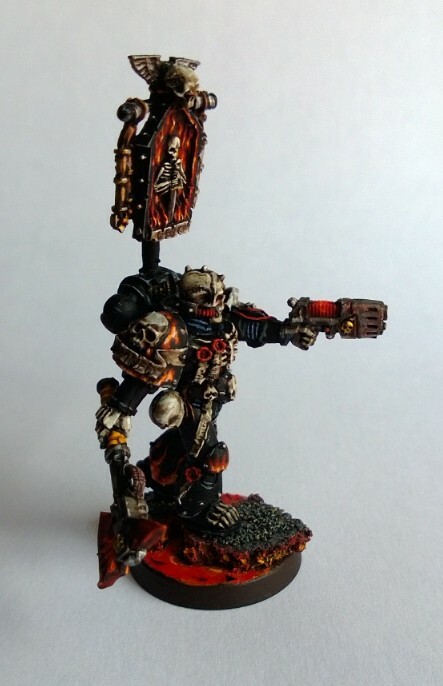 So i weant in search for a tutorial on youtube and found one through @bill_40k on twitter. Last night i gave it a try and here are the results! Here we are again for another mini update! So what’s new then ay? 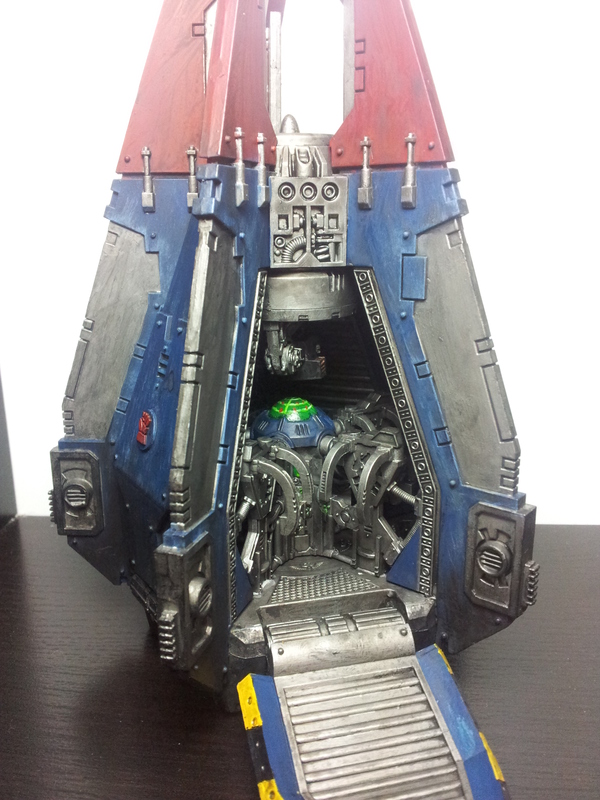 only just gone and finished my drop pod now! overall I’m pleased with how it turn out, but was a bit of a pain in the arse to assemble so I wont be getting any more I tell you that now! 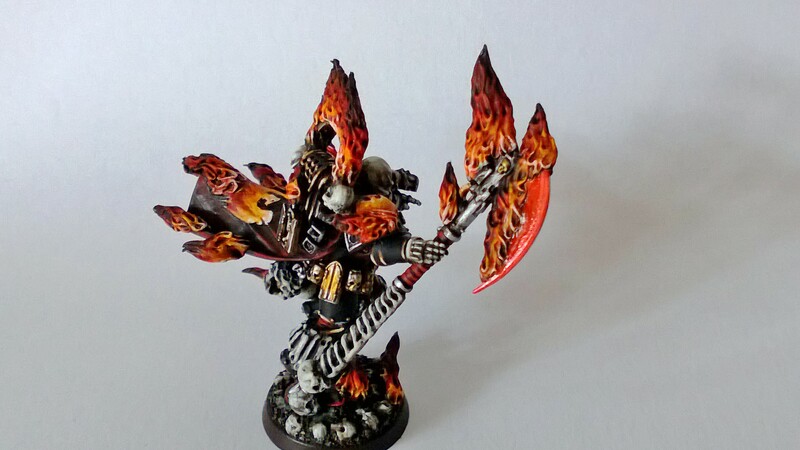 The Soul drinkers om… on legion of the damned!